In a cute bit of cross promotion from New Zealand, the folks at Walt Disney in the southern hemisphere have used the emotions from this summer's Pixar Animation film Inside Out as a way to help one of Disney's other big summer blockbusters, The Avengers: Age of Ultron. Footage from the promising Pixar flick has been edited around one of the trailers for the Marvel Studios sequel to make it seem as if Joy (Amy Poehler), Sadness (Phyllis Smith)Fear (Bill Hader), Anger (Lewis Black) and Disgust (Mindy Kaling) are watching and reacting to the trailer. It's a clever way to promote both the Disney flicks. Watch! 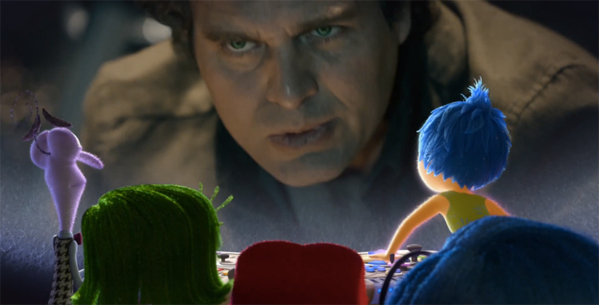 You can still watch the full trailer for Pixar's Inside Out right here. Growing up can be a bumpy road, and it's no exception for Riley, who is uprooted from her Midwest life when her father starts a new job in San Francisco. Like all of us, Riley is guided by her emotions - Joy, Fear, Anger, Disgust and Sadness. The emotions live in Headquarters, the control center inside Riley's mind, where they help advise her through everyday life. As Riley and her emotions struggle to adjust to a new life in San Francisco, turmoil ensues in Headquarters. Pixar's Inside Out is written and directed by Pixar veteran Pete Docter, who co-directed Monsters, Inc. and directed Up before this. Disney will release Pixar Animation's Inside Out in theaters everywhere (in 3D) starting on June 19th this summer. Excited? Although I am listening to the Ultron soundtrack right now (without reading track titles!) and getting pumped.